Ford Mermaid Mistral (2726T) 175hp Six Cylinder Heat Exchanger Cooled Turbocharged Marine Diesel Engine Fitted With PRM 1000D3 Hydraulic Gearbox. Based on the very last of the Ford Dover engines. This one being a 2726T Otosan unit. 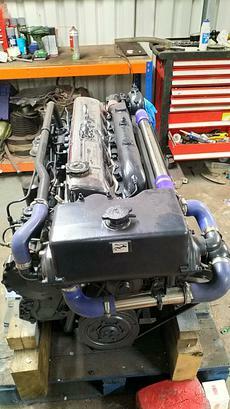 This engine was in storage as a spare engine for one of our commercial clients and was reportedly used for around 7 years in a commercial vessel before they obtained and stored it. It has been test run at our workshops for 2 hours where started and ran well from cold. No discernible crank case pressure. All fluids clean and in the proper places. Small amount of exhaust smoke at max power as with all Ford Mermaids but otherwise in good order. Our workshops have also fitted a PRM 1000D3 3:1 reduction hydraulic gearbox making this a very attractive package for heavy duty use. 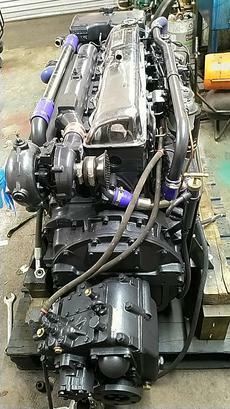 The engine has since been fully serviced and repainted ready for use.